We’ve discussed in previous blogs the benefits of having a deck installed. But do you know where to start in terms of hiring a deck installer? The absolute last thing you want is to make a mistake by going with a company that fails to meet your expectations. Keep reading for tips on how to make this process simple and hassle-free. Look for reviews, recommendations, and licensing – As with other major home projects, you want to start by doing your homework. Ask neighbors or friends who have recently had a deck built about their experience. If they were pleased with the quality of work and price, see if they would recommend the deck contractor. Don’t just stop there, though. Be sure that you scour the web for other reviews and testimonials. Lastly, double-check that the list of decking companies you like are licensed and insured. Ask questions – Hopefully, you’ve got three or four options at this point. We recommend that you look at their website and determine how long they’ve been in the business, whether or not they offer a warranty, and if they can provide references. You’ll also want to bring up your specific project and ask them how long it would take to complete. If their website fails to provide all of this information, make it a point to call them. When dealing with local deck builders, it’s never a bad thing to ask too many questions. Get a written estimate – As explained in this guide from Angie’s List, the next step involves inviting up to three deck builders to your home and asking them to provide a written estimate of costs. Aside from total cost, this should include a detailed breakdown of materials separated from the hourly labor cost. Do one last check of references – It’s finally decision time. You’ve narrowed your list down to just two outdoor deck builders. How do you choose which company best suits your needs? Though it may seem repetitive, you’ll want to contact references and ask about work quality, professionalism of the crew, price, and if the project was completed in the time specified. 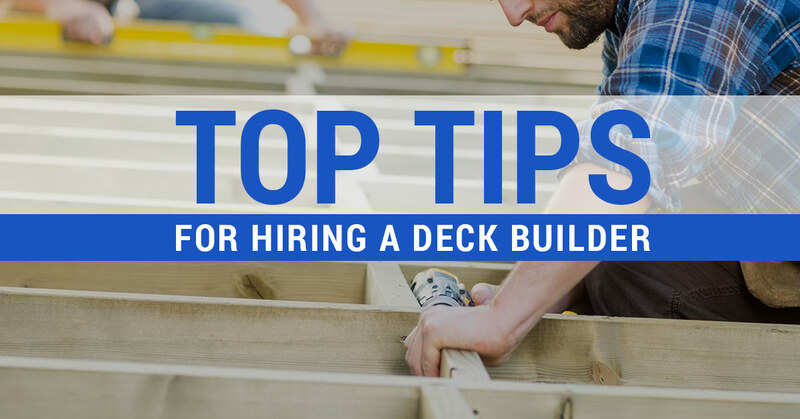 Give the edge to higher quality – If you’ve gone through each of the aforementioned steps but still can’t decide on a deck builder, don’t panic. Instead, it’s best to select a company that does the highest quality of work. It’s no secret that a beautiful, properly installed deck yields a solid return on investment. So when push comes to shove and have a decision to make, the experts recommend giving the nod to a contractor that’s more skilled and experienced. Why Team with Ready Decks? Is it possible to install high-quality, affordable decks? For years, Ready Decks has made this dream possible for more than 15,000 customers. As the go-to decking professionals, we do whatever possible to offer a gorgeous deck at an incredible price. That means combining using only premium-grade, treated lumber with our innovative, patent-pending building system. Not to mention, we stand behind every product, from standard decks to pool decking options. Take the first step toward an amazing deck and contact us today.